Mmmm…I love the smell of chemicals in the morning. New books, in two senses of the word. When undertaking to read the 100 Greatest novels (according to the Guardian newspaper and some other literary bods) I knew I’d have to part with some real money, and wouldn’t get all of them in charity shops, etc. I couldn’t even get a good copy of ‘Clarissa’ secondhand on eBay, so had to shell out £15.99 for the paperback. I love the bus tickets/margin notes/suspicious stains of second-hand books, but I also enjoy the heady industrial scent of fresh ink and paper. And so I have now have these two. 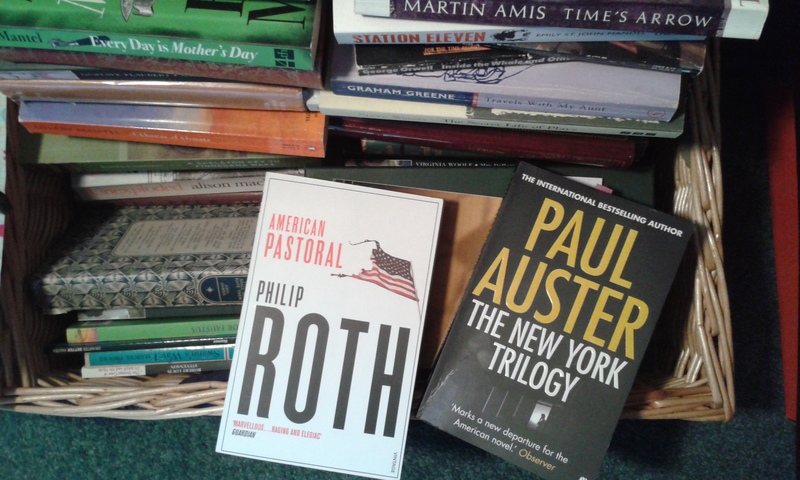 They are also new as in I had never heard of Paul Auster, and while I had heard of Philip Roth as a writer, it was on in the same way of knowing Louis VII was a king, but I have no other details than that. Usually books lead onto each another. An author will quote another work, or there will be contemporaries of theirs to research to get a better picture of a time or theme. Or, I see them all cheap and buy them by the armload, but at least I do read the blurbs to see if I like them. These two, I had no idea about at all, and it doesn’t matter, as they are on the list, and so must be read. I started ‘New York Trilogy’ in the bath last night and enjoyed it so much I forgot where I was and resembled a prune’s grandmother when I got out. One that smoked and had never used sunscreen. “enjoyed it so much I forgot where I was and resembled a prune’s grandmother when I got out. One that smoked and had never used sunscreen” Now there is an endorsement worthy of a dustjacket! LOL I have heard many good things about The New Trilogy. I will have to get to it some day. The smell of a new book is just gorgeous! I tried Auster many years back and didn’t click with him – maybe I should have another go! I love The New York Trilogy. I even have a grahic novelly thing of the first part. Yay! Lucky me! Brooklyn Follies is good too. Some of his books are more accessible than others, I find. I don’t think I’ve read anything by Phillip Roth. I managed to find both of those in local secondhand shops and actually did a bent elbow fist bumping ‘Yes’ to myself. I’ve heard great things about both. I read a Philip Roth novel for my book group a few years back – ‘The Plot against America’, and it was spectacular, so I’m really looking forward to ‘American Pastoral’. It’s novelty to be reading books where stuff happens, so far ‘New York Trilogy’ is the anti-Clarissa. I’ve been restraining myself from ordering the graphic version Ashley Lily Scarlett mentioned. I fear my mouse finger may have got the better of me by bedtime. Auster’s mind is on another plane. His observations of the mundane remind me of Italo Calvino. I especially like Auster’s short stories. My favorite Roth is The Human Stain, though I have been told that American Pastoral would be my new favorite when I read it. I haven’t read it yet. Happy reading! I’m excited to get to American Pastoral as I have absolutely no idea what is inside. With so many books on this list even if I haven’t read them I know roughly what’s in there, but this is fun! Your excitement makes me smile! Books in the bath, you are certainly living on the edge, the thought of Titanic style endings for my books makes that a no no. Adventure is not for wimps.